Chocolate at breakfast? Say what?!?! OH yeahhhh. This chocolate bark is the perfect replacement for your morning coffee. If you've been a joyous reader for a while you likely already know that breakfast is my favourite time to enjoy chocolate. This is because it's the best time of day to eat something as energizing and stimulating as chocolate. 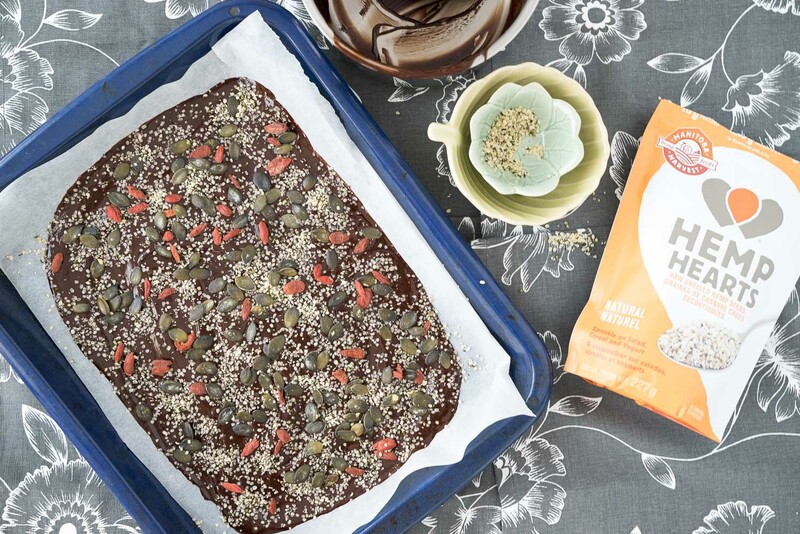 This chocolate bark will give you a nice boost of clean energy! And it's completely guilt-free. Hemp Hearts: A fantastic source of complete plant-based protein, fiber and good fat -- plus they are darn tasty! I've got many more Hemp Heart recipes on the blog. This is a kitchen staple for me. Pumpkin Seeds: Great source of protein, vitamin E and minerals such as zinc and iron. They add a nice crunch. Goji Berries: Rich in amino acids, vitamin C and fiber. It's almost like making a chocolate pizza. 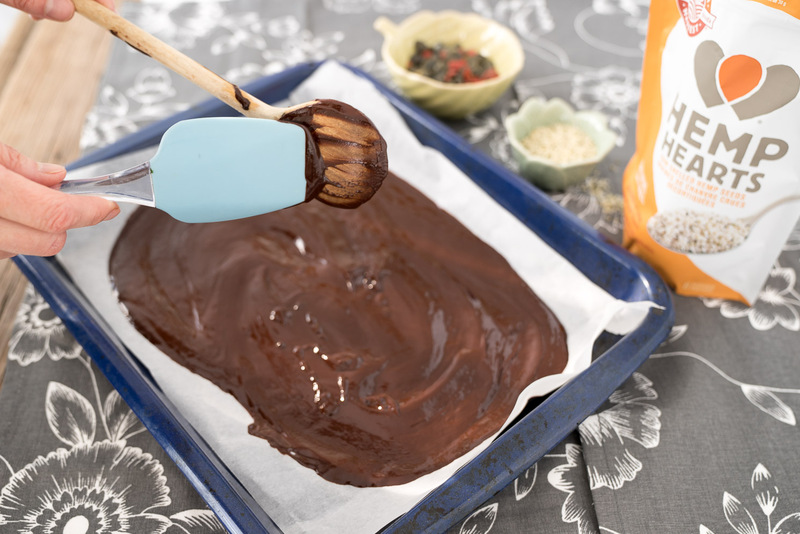 Decorating the chocolate bark is the fun part (so is licking the spoon). In a small saucepan over low heat, melt coconut oil. Slowly stir in cacao powder and maple syrup. When fully combined, remove from heat. Line a cookie sheet with parchment paper. Pour chocolate bark mixture on to parchment paper. 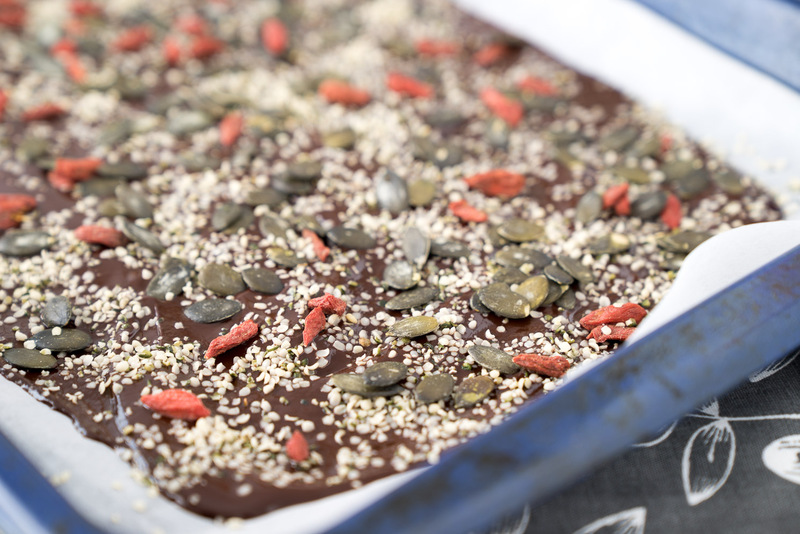 Sprinkle with hemp hearts, goji berries and pumpkin seeds. Freeze for a few hours. Break into pieces and enjoy! Caution: I actually recommend against eating this in the evening, it might actually keep you awake at night. As mentioned above, it's stimulating -- in a good way! I hope you love this recipe as much as I love it. This post was created in partnership with Manitoba Harvest, however all opinions are always my own. Very timely. Leaving today on a jet plane (sounds so good) for Spain to visit dtr. new grandson & family. I might just make some of this up to have on the plane for a morning snack. Wasn't sure what they would serve & really didn't want to ask for a special diet, so taking a few of my own snacks to count on. These look amazing! Can't wait to try. Question: What if my coconut oil is no longer solid? Why isn't this considered detox friendly? These are similar to your chocolate bark in your recipe book and I love it. Definitely want to try this version and thinking it would be a special treat on Christmas morning too. It even has red and green in it! Can't wait to make this! Do you recommend soaking the goji berries first to rehydrate them? Question: I made this tonight with cocoa powder instead of cacao powder so we can have this as a dessert. It got all lumpy and I had to add more oil...any suggestions when making this substitution? I haven't made it with cocoa powder so that could be why but usually lumpiness is due to the temperature being too high. When you added more coconut oil did it work? Also, using a wire whisk will help. Absolutely delicious! I made this last night and had some with a cup of joe at the office this morning. Thank you so much for sharing! I plan to make the Chocolate Beet Smoothie Bowl this weekend! Looks delicious- do you keep it frozen after it’s set or can you refrigerate it? It should be fine in the fridge but it will definitely be a little softer texture than if you keep it in the freezer. Do you use refined or unrefined coconut oil? I’m wondering how it will taste and that depends on the type of coconut oil used. Thank you. I always use unrefined coconut oil so it has a lovely flavour. It's not going to drastically change the recipe if you use refined though. Thank you :) I’m excited to try this recipe. Can't wait to try this recipe! Questions about cacao powder versus cocoa - is there a difference and if so, what? Also, my family is from Greece and there, cacao is a common beverage served warm, often in the morning as part of breakfast. Is this a better/healthier choice rather than using cocoa powder?